These Proform Small Block Chevy Harmonic Balancer Covers offer improved readability, more stable Top Dead Center indication and timing accuracy, and enhanced appearance for a previously ignored under hood area. They are available in many vivid finishes, resulting in the appearance of a more expensive balancer. Each cover is distinctively marked with Top Dead Center and the proper timing degrees. 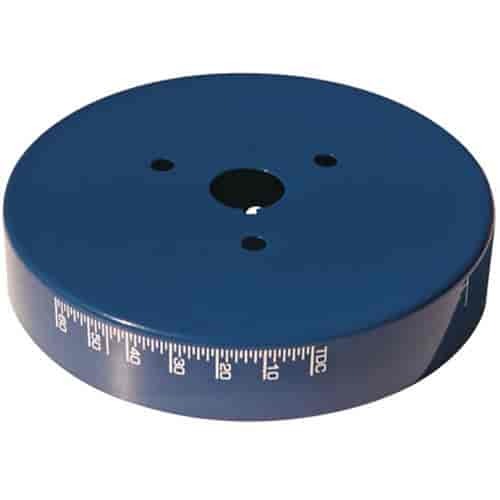 Using this cover improves timing accuracy because over time the etched outer inertia ring of a typical harmonic balancer may slip in relation to the center hub of the balancer. This causes the etched markings to provide an inaccurate indication of Top Dead Center for the #1 piston. Mounted directly through the center hub, this cover eliminates the effect of any outer inertia ring slippage. Made from high quality aluminum with a durable long lasting finish.